"Make plans and God laughs." I bought tickets to go to a Derby Party/Fundraiser for MS at a local country club. . . I bought a dress and a hat. . . but now I'm not going. Instead I'll be celebrating my grandfather's life in MI with my family. Do you think my Derby Hat is funeral appropriate?! I figured I would share my hat anyways in case you are going to a party and want to make a last minute Derby Hat! The only problem is I'm bad about DIY photo taking and once I get into my project I forget to take photos of each step but you'll get the idea. I bought this black floppy hat at the Loft Outlet (one of my favorite stores) and it came with the black and white polka dot sash on it. Fortunately it came off easily and could even be glued back on if I wanted to. I went to Michael's and bought silk flowers and some other swag for my hat (don't forget to use their coupon that is on the website every week)! I bought two flowers because I wasn't sure the direction I was going in and wanted options. . . I bought this hot pink ribbon to use on the base of my hat. I actually only applied hot glue to the spot where the two ends meet. That way you can't see hot glue marks along the ribbon and I'll be able to pop it off after very easily (to use for something else or to make a different Derby Hat next year). I actually wasn't impressed with Michael's "swag" selection so I went to Jo-Ann Fabrics too. I was able to find a roll of hot pink tulle in the dollar bin and this flower/leave thingy in the wreath section. Then my mom and I got to work (yes I needed help). We looped the tulle and hot glued that to the hot pink ribbon. There is not really any right or wrong way to do it. I just googled "Derby Hats" and used a few that I liked for my inspiration. I decided on the big flower (go big or go home) and had to cut the long stem off of it. Once the back of it was flat I just applied hot glue to it and stuck it on (again to the tulle and ribbon). Then I cut the little flowers and leaves off and glued each in the spot I wanted them. Everything is glued to the ribbon and/or each other. Nothing but the hot pink ribbon is glued right onto the hat. My mom did end up putting a couple of stitches through the center of the flower into the hat to secure it. This will be easy to cut to remove after. Here is a close up. I think it looks really pretty. I had also bought some feathers but didn't like the ones I bought once I opened the package. I returned them and bought some black and hot pink feathers but didn't get a chance to attach them and then found out I wouldn't be going to the Derby party so I left it as is. . . This is my dress. I got it at Banana Republic and I LOVE it. I love the detail with the stitching at the waist and at the hem. I'm still wearing it on Saturday - just not for the Derby! -Buy extra "swag" while at the local craft store. Better to have more than you need and return then to not have what you want when you sit down to make it. -Go big! Have fun with it. How often do you get to wear a big floppy hat covered in tulle and flowers?! Might as well get out of your comfort zone a bit. -Be careful with the hot glue gun. I almost burnt my fingers quite a few times! -Recruit a "crafty" partner to help you. My mom is very good with these kind of projects and I liked having her opinion while doing it. It helps me to get confirmation that it looks cute and not ridiculous! Plus it is helpful to have an extra set of hands while gluing! -Wear it around the house a few days before to become comfortable in it. Take a lot of selfies. Feel fabulous! Are you going to a Derby party this year? Or maybe you are even lucky enough to be going to the actual event! P.S. When I went to the Banana website to link to my dress I realized it is called "Navy" and it TOTALLY looks black to me. Hence why I have a black hat. I'm surprised by this and glad I didn't have a fashion faux pas! Ha! P.P.S Emily posted about her DIY Derby Hat last year and I love it (plus she is hilarious) so you should check out her post too! I'm back with more of my DC Vacation. Are you excited?! Make sure you read my posts about the Newseum and the Cherry Blossom Festival too! Rachel and I took the Metro to Arlington (aka Old Town) after literally walking 10 miles around DC during the Cherry Blossom Festival. We were EXHAUSTED so first stop was at a coffee shop where I experienced my first fancy coffee drink. We sat and relaxed while charging our iPhones. Very important stuff. 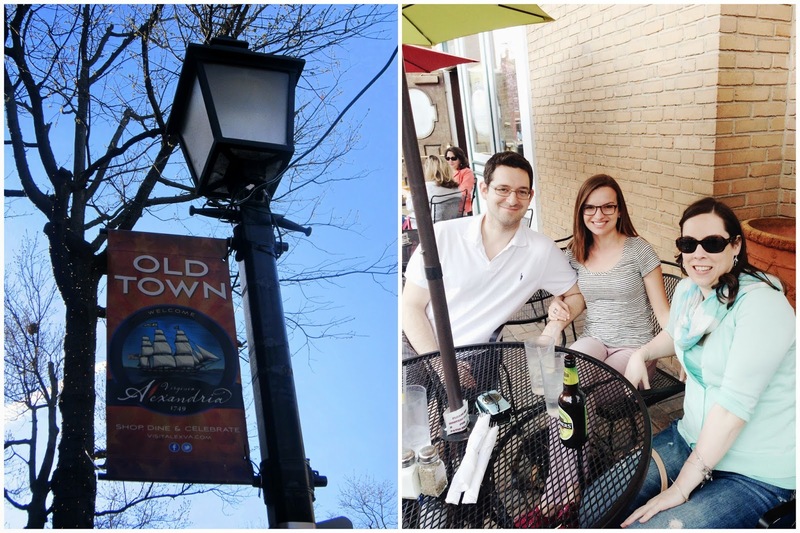 Arlington is such a cute area so I'm glad we rallied and explored the area. The store fronts are so pretty and I waited FOREVER for these people to move out of my photo. Like seriously for over 10 minutes and they just would not move so I gave in and took the photo with them in it. I was not happy about! All the little side streets are so pretty especially with everything blooming. We had such a nice time walking around and window shopping! Rachel's husband met up with us for dinner and since it was so beautiful out we ate outside. A post is coming soon about where we ate during my DC Vacation. . .
Arlington is such a pretty area and I'm glad I got to see it. We had a nice afternoon walking around despite being exhausted! 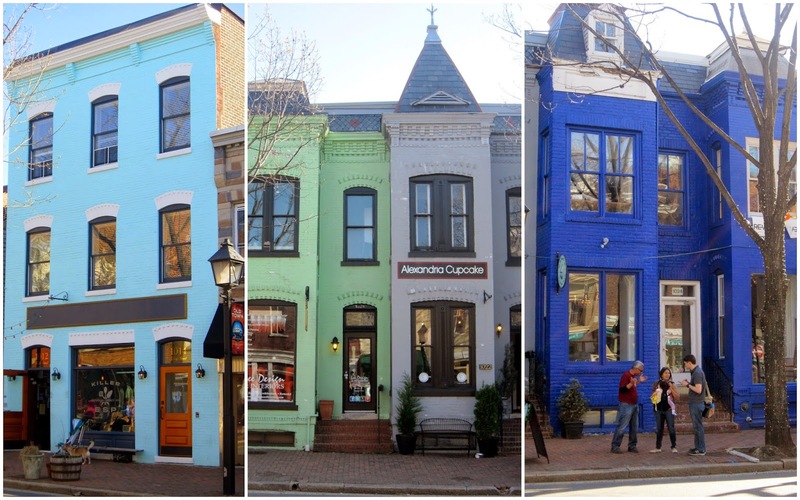 Have you been to Arlington? 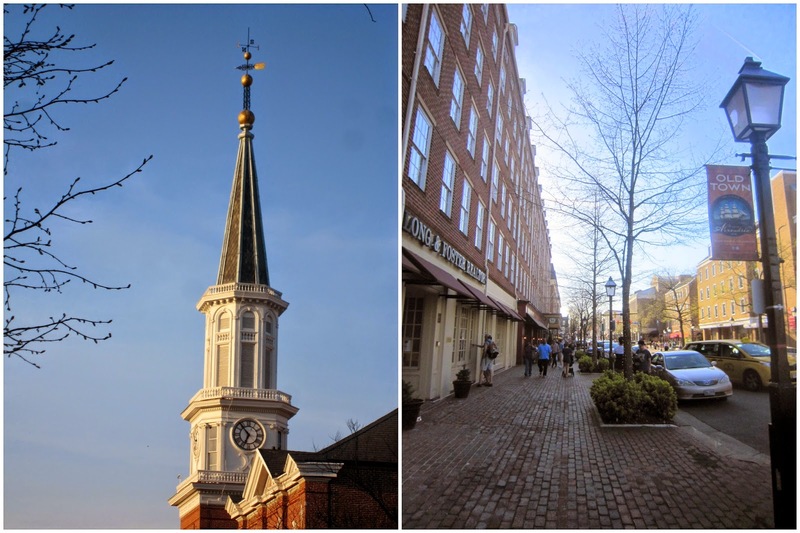 Tuesday is Boston Blogger's "Spring Fling." Over 100 bloggers from Boston and beyond will gather together at Highball Lounge to socialize, eat, drink and buy raffle tickets for a chance to win the amazing prizes listed below! For those of you who don't know I have MS. I was diagnosed in 2008. Ever since, I've been busy raising money, raising awareness and participating in lots of events. This will be my 5th year participating in the MS Challenge Walk (3rd year walking since I was crew the first 2 years) and Kate and Emily have joined The Bean Team to walk 50 miles by my side. I couldn't be more excited to have them as teammates. To think we have known each other for less than a year "in real life." We started out as blog friends and have become good friends who enjoy so many of the same things especially country music concerts! We will be raffling off several prizes in order to raise money for the MS Challenge Walk. We are each required to raise $1,500 in order to participate. Hopefully we will make a lot of money at this event to put toward our goal! So now what you've all been waiting for. . . the amazing raffle items. . . If you can't make it to the event but would like to donate to The Bean Team you can do so here! Thank you!! THANK YOU SO MUCH to all of the donors. We couldn't have done this without you. We are so appreciative of your generosity! Kate, Emily and I wish we could win - these are some incredible prizes. Good luck to all the bloggers coming to the event! We can't wait to see you. Which raffle prize are YOU most excited about?! I don't often blog on the weekends and yet this weekend I've posted both days. Yesterday was for happy reasons as The Bean Team had fun at MuckFest MS but today is in honor of my grandfather, Paul who died peacefully at home with his wife by his side. He was 90 years old and lived an amazing life filled with travel and adventures. 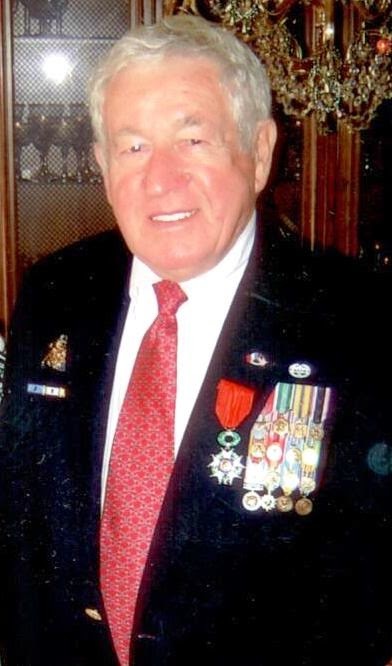 He was in WWII, the Korean War and the Vietnam War. 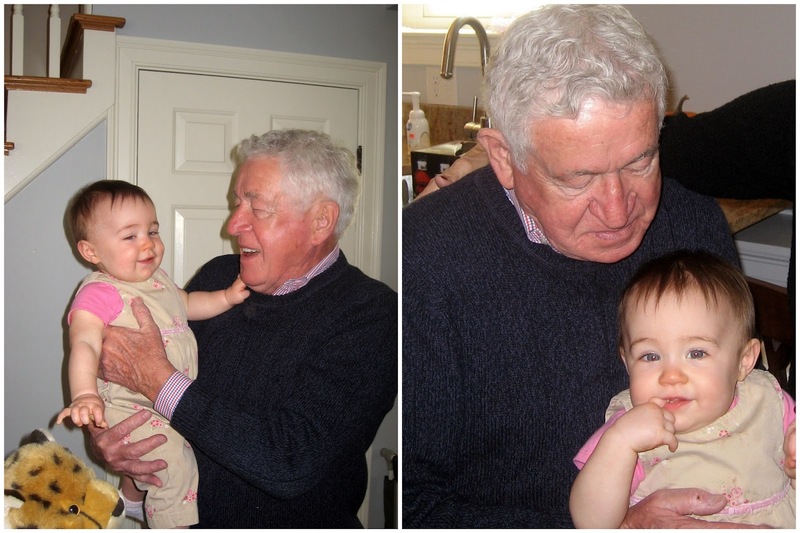 He is now at peace and today I want to remember him by sharing some photos. Later this week my family and I will travel to Michigan to celebrate his life. At my brother's wedding. We clean up well! 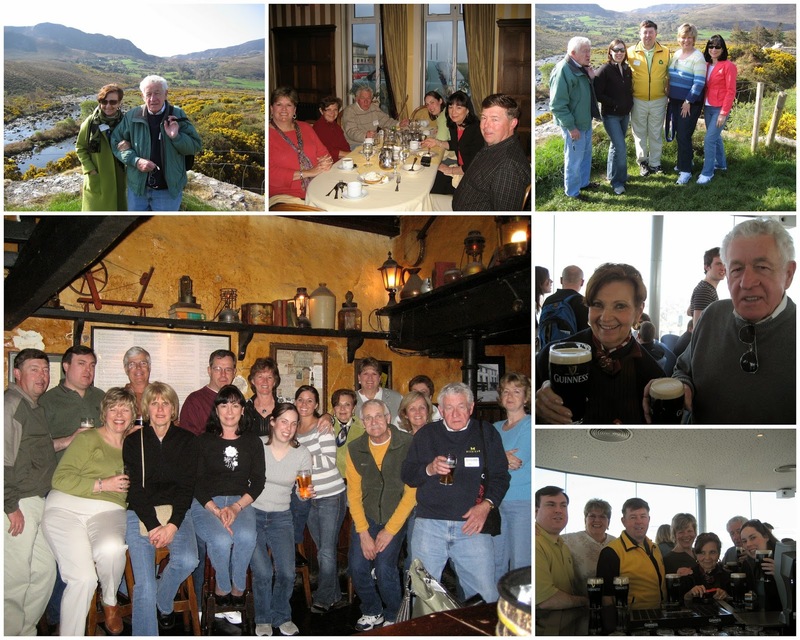 I'm so thankful for our family trip to Ireland (many of my family members and several family friends joined us). We have so many fun memories from that trip. I love how he and I are the only 2 holding a pint of beer in the large group photo! Cheers! At my mom's surprise 60th birthday dinner. Not only was she surprised that we were throwing her a birthday dinner party but she was shocked to see my grandfather there all the way from Michigan! 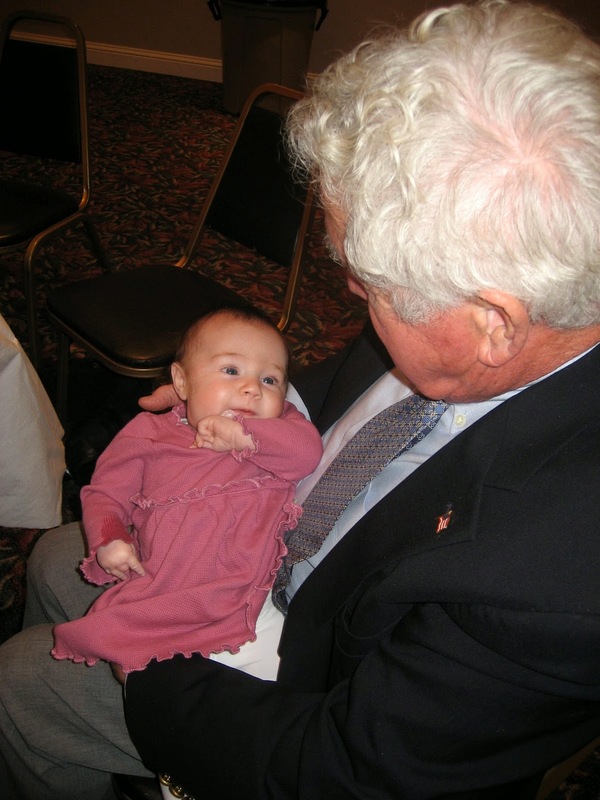 He loved being a great grandfather and couldn't wait to meet Peyton after she was born. I love the way she is looking at him here! 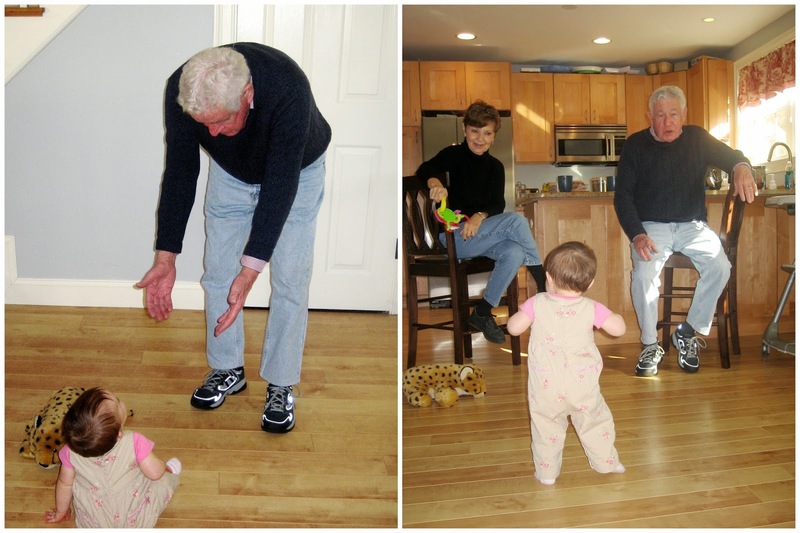 With Peyton again when she was about 11 months old and had just learned to walk! 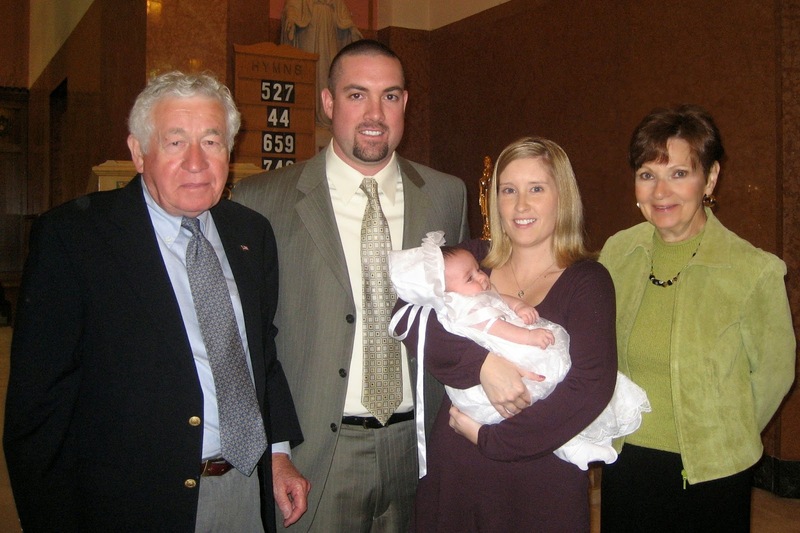 With Ella after her baptism. 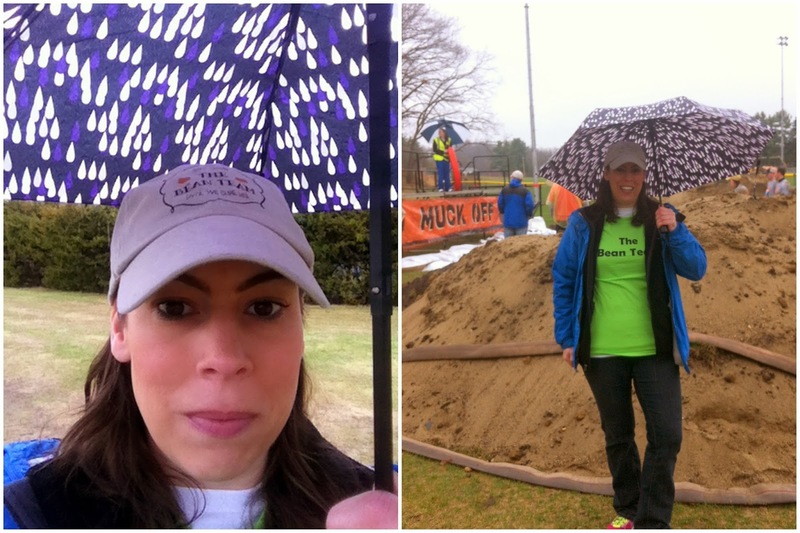 This weekend is MuckFest MS weekend in Boston (well Fort Devens actually). Since the event doesn't have enough water and mud Mother Nature thought she would add a little more water. . . it was pouring rain all day. . . and 47 degrees! The Bean Team had 10 members plus a photographer/cheerleader (me). Despite the rain and cold they were all ready to go at 9:30 AM! 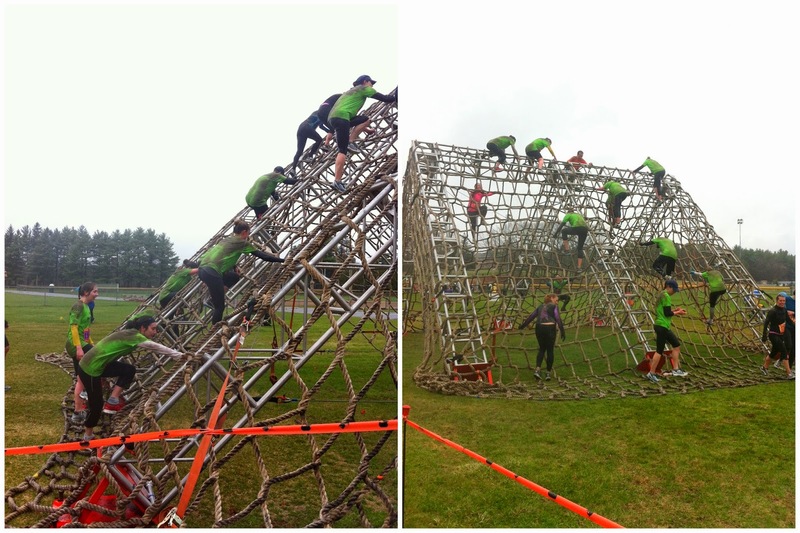 The first obstacle which is right at the start, each person climbs some dirt hills and then they go through a water pit. . . after this I went toward the end to wait for the team. The course was a 5k this year instead of 5 miles like last year. To see more of the obstacles go here. I waited at "Muck Off" which is an obstacle where they jump off a platform into a deep water pit. After this obstacle there are 3 more that are very close together and close to the finish line so I was able to follow along with the team until the end from here. I would say I'm the BEST cheerleader ever! It was cold and very wet. I was wishing I had a pair of Hunter boots. Note to self: buy Hunter boots! Below is a video of The Bean Team members jumping into the water pit. Luckily nobody cursed! Meghan (my cousin-in-law) on the far right did a karate chop pose on her way into the water. She wanted it known that she had perfect form! Ha! I think she should have done a cannonball! This one was MUCH muddier than last year. Blame it on the rain. These guys are all such good sports. They didn't let the weather ruin their fun! Doug, Katelyn and Jenn started celebrating being done while waiting for the rest of the team to get through the tubes. And they finished as a TEAM! I don't even know a few of the people on The Bean Team for this event but I must say I love them all. They didn't all know each other (but everyone knew at least one other person) but you would have never known it. They all stayed together for the whole event and supported each other through each obstacle. The team had people in their 20s all the way to their 60s and yet they all finished strongly and together. So proud of them! I'd say it looks like they had fun and made the best of the rain and cold. Thank you to each and every one of you for being a member of The Bean Team. 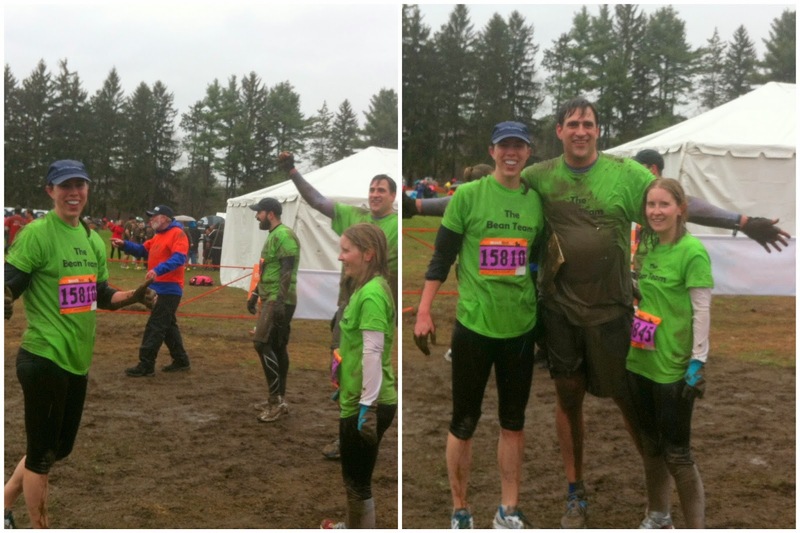 Thank you for helping to raise awareness about MS is the most fun and mucky way possible. Love these ladies. . . Jenn, Meghan and Katelyn. . . best family a girl could hope for (but they should have told me we were doing "crazy" poses)! The team got showered and changed before drinking a quick (free) beer. Everyone was too cold to hang out in the food area so we decided to go to a local restaurant for lunch (and to warm up). Too bad about the weather b/c it was so fun hanging out afterwards last year. You can read about it here. I didn't get around to take many photos of all the awesome signs but this one I thought was adorable. I have to say they are pretty creative with the theme and slogans. Lots of play on words! I must once again mention this year that this event is SO well run and organized. There are a lot of people who do this event (so many that they opened a 2nd second day on Sunday). Everything from the parking, to the check in to the course is run smoothly. It is quite impressive and adds to the fun. Oh and while there is a registration fee (varies depending on how early you sign up) there is no fundraising requirement! So no pressure to ask people for money if you don't like doing that. The Bean Team did raise $100 since a couple people made donations but we are focusing the majority of our fundraising efforts on the MS Challenge Walk since The Bean Team needs to raise $9,000 for that! I've already heard that many of the members are coming back next year for more MuckFest. So if you are interested in joining the team let me know! If you live somewhere other than Boston go here to see if MuckFest will be in your city!